There are ghost towns scattered all across our country. All of them were real towns at some time or another. The book I wrote for Summerside Press is set in what is now a ghost town. One building from the time period of my book is still standing and well cared for. The church. A good friend of mine went to the area and took pictures of what's left for me. Some were ruins of rock walls where houses had stood. Broken fences and gates and other things can be found scattered over the area. At the time of my book, the area was a thriving mining town with a couple of banks, a stock exchange, stores, and a stamping factory, among other things. But none of that is left. I've taken us back to that time when people loved the area and commerce reigned. In addition to the mines, the railroad ran close to the town, so the people could bring in all the products available from other areas of the country. I've found another ghost town in a different state that I've written a proposal for. As happens with some of the ghost towns, people in the area saw the potential for making it a tourist spot. Old building have been brought in and there's a thriving tourist trade. I really hope the publisher shows an interst in this story, too. I have another friend who lives near this place and is willing to go take pictures of it for me. I can find pictures on the Internet, but I want pictures that we can use in the book. This friend told me about another ghost town near where she lives. It dates back to the early 1830s. All the buildings are standing and in fairly good condition, but the whole town is empty. Not a soul lives there. She said it's spooky to drive through there, because everything looks so good, but no one is there. When I find a ghost town anywhere I'm visiting, I always like to go see it, whether it's been turned into a tourist place, or not. You can find a lot of interesting things that tell you how people lived in that area in the past, and that's what I like to write about. We learn a lot about our own history that way. I walk through whatever buildings are standing and ask questions like, Who lived here? What did they do? What happened to keep the town from thriving and continuing to the present day? Answers to questions like that are often the beginning of another book. Happy hunting for ghost towns near where you are. If you've visited any, please share about them in the comments. And check out my book, Love Finds You in Golden, New Mexico, which is my Summerside Press book set in a town that is now a ghost town. The book was awarded the Will Rogers Medallion Award for Excellence in Western Media. It's available in print and ebook formats. And as a special surprise, I'll send a print copy of the book to a winner chosen from those who leave comments. Good morning, Lena. Enjoyed your book "Golden". It's a shame about the little community. I was through there in more prosperous time. I enjoy ghost town trips also. Hi, Linda, glad to see you here. I'm glad you liked Golden. Loved this post! I love reading about ghost towns, but I've never been to one. I'd love to read your book and the one you have a proposal on. I'd love to see the story you wove out of what used to be there. Thanks for the chance to win! Sally, you might like to check to see if there are ghost towns within driving distance from where you live. I will do that! It wouldn't surprise me at all if there were lol. Thanks! Susan, I hope you find one. When you do, let us know where it is. Angela, you have as much chance as anyone else to win. Oops! Forgot my email! It's jimmynmatthewsmom [at] netzero [dot] com. Bethany, I hope that doesn't happen to your town. I live in the Dallas/Fort Worth Metroplex, in one of the suburbs, and I'm grieved by the number of businesses closing and houses abandoned. That's what happens in a weak economy. I pray for the country. I read "Golden," Lena, and loved it. So fun to hear about how you draw a story from the ghost towns. Davalyn, thanks for sharing about how you liked my book. Several years ago, my family and I enjoyed a visit to the Old Hundred Gold Mine, about five miles east of Silverton, Colorado, near the ghost town of Howardsville. Up higher on the mountain, you can still see the boarding house the miners used. This whole area is really a neat place to visit! Britney, it sounds like a good area to visit. I've been to Summit County Colorado. I've proposed a series with the first book set there in 1892. Three publishers are interested in the series. I hope one of them offers a contract soon. Maxie, thanks for sharing that history with us. I'd have loved hearing some of those stories. And, The train was there. I really messed this one up by not editing it. Thanks, Maxie for the added information. I've never visited a ghost town, but I've read several books about them! Tonja, glad to see you here. I have never visited a ghost town before. I would love to though! Beth, maybe you'll get a chance sometime. I've never been to a ghost town, but I love the era of time. I went through an old three story railroad depot that was abandoned. Many,many years ago this small town had a thriving business of lumber and this town was built around this. I remember that depot still had the old vault. It was amazing, but a little scary. Thank you for sharing and please enter me in the giveaway. Barbara, I would have loved to see that old vault. Sharon, some of the things left behind kind of make you sad, don't they? I'd love to see your ceiling, Kathleen. 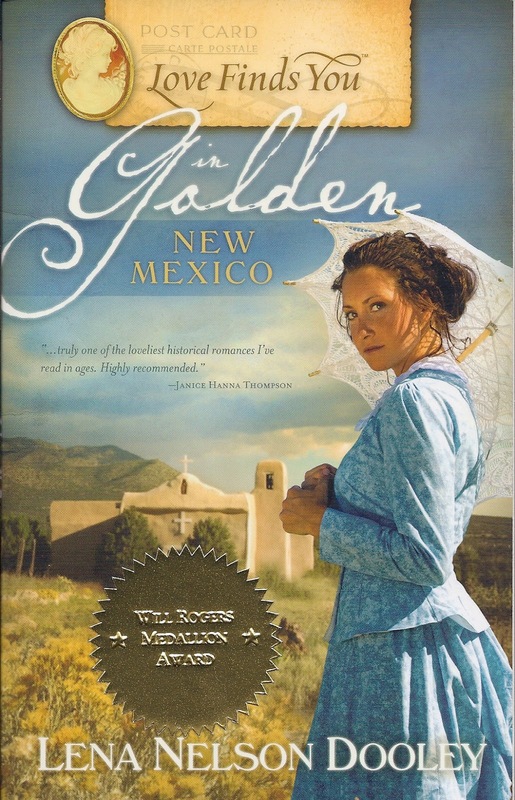 Barbara Thompson is the winner of a copy of LOVE FINDS YOU IN GOLDEN, NEW MEXICO.